Why Won't You Grow?! 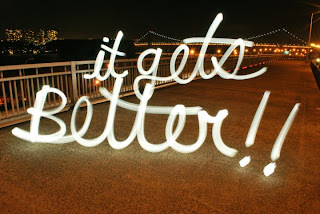 : NaBloWriMo #13: It Gets Better . . . I'm not posting my own contribution to the It Gets Better project. I was simply musing on the idea that, as you age, things can get better in life. The aim of the It Gets Better work is to give hope to Lesbian, Gay, Bisexual, and Transexuals that the (likely) discrimination and (probable) bullying they receive is NOT the be-all and end-all of their existence. It is a result of youth, naivete, and ignorance. And by giving them public words of encouragement, the IGB posters are saying, "Hang in there! Time will make things better." This sort of sentiment is not only needed by members of the LGBT community, however. I know that when I was in the midst of raising up my young children (as if I'm NOT doing that anymore? ), but especially at their youngest and most needy ages, I could have used a succession of videos from parents telling me that it would get better . . . that the kids would continue to grow, mature, and use recognizable English. They would, in fact, respond to your jokes with laughter and smiles. They would grow ever more independent over time and begin to make their own choices. They would demonstrate an ability to NOT need you all the time. Similarly, people adjusting to a new city or moving away from their family can also be encouraged that their isolation will change over time. They will gain new friends, new knowledge of their community, new opportunities to grow comfortable. They will make strangers their friends and make a residence their home. People taking on a new creative task could also use such encouragement. In the beginning, there is probably excitement and there are so many ideas. But after several days of steady work, the thrill of the creative process becomes the tedium of the every day. Finding that inspiration to carry you to the summit of your task and hold you steady on the decent . . . that might be in short supply as tasks become routine. But if only someone could come along and provide those powerful words that things are going well, that your work is appreciated and might yield valuable fruit for yourself and possibly for others. We can all use these words of encouragement from time to time. We all face challenges in our lives, some large and life-threatening and others small and inconvenient. But receiving that acknowledgement from others that you are NOT alone . . . that you're efforts will be useful in the end. There are few things in the world that cost so little but could mean so much. It DOES get better, if you want to believe that it can.